Steering angle sensor signals are input to the skid control ECU (brake actuator assembly) via the CAN communication system. 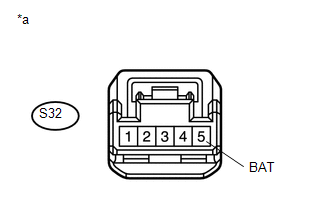 When a malfunction occurs in the communication line to the steering angle sensor, U0126 is output. If a DTC related to the CAN communication line is output, first troubleshoot the CAN communication line. Normal communication between the skid control ECU and the steering angle sensor and abnormal steering angle sensor zero point. When U0073, U0124 and/or U0126 is output together with C1434, inspect and repair the trouble areas indicated by U0073, U0124 and/or U0126 first (See page ). When any of the speed sensors or the yaw rate and acceleration sensor (airbag sensor assembly) has trouble, DTCs for the steering angle sensor (spiral cable with sensor sub-assembly) may be output even when the steering angle sensor (spiral cable with sensor sub-assembly) is normal. When DTCs for the speed sensors or yaw rate and acceleration sensor (airbag sensor assembly) are output together with DTCs for the steering angle sensor (spiral cable with sensor sub-assembly), inspect and repair the speed sensor and yaw rate and acceleration sensor (airbag sensor assembly) first, and then inspect and repair the steering angle sensor (spiral cable with sensor sub-assembly). 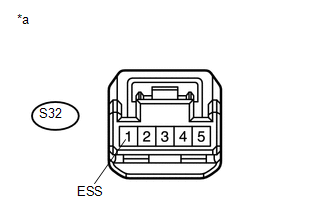 (e) Drive the vehicle at a speed of 35 km/h (22 mph) and turn the steering wheel to the right and left to check that no speed sensor or yaw rate and acceleration sensor DTCs are output (See page ). If there is a malfunction in any of the speed sensors or the yaw rate and acceleration sensor (airbag sensor assembly), an abnormal value may be output although the steering angle sensor (spiral cable with sensor sub-assembly) sensor is normal. If speed sensor and yaw rate and acceleration sensor (airbag sensor assembly) DTCs are output simultaneously, repair these two sensors first and inspect the steering angle sensor (spiral cable with sensor sub-assembly).